In a major boost to the proposed 850-crore Pod Taxi project, the National Highways Authority of India (NHAI) will soon sign an agreement with the Municipal Corporation of Gurgaon to build a 12.30-km track from the Delhi border to the interiors of Gurgaon. The Pod Taxi project, also called the personal rapid transport system, will have a 12.30-km track from the Delhi-Haryana border to Subash Chowk via Rajiv Chowk on Sohna Road. 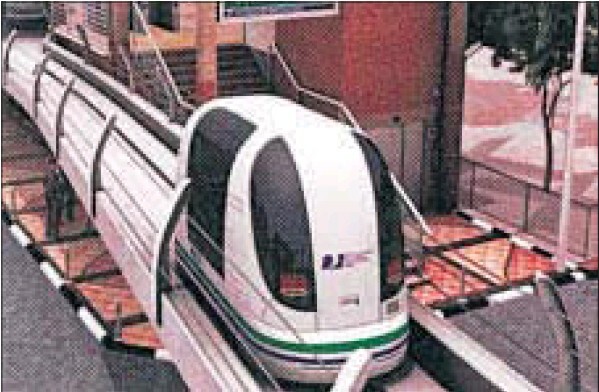 The proposed pod taxi network in Gurgaon is expected to have 14 stations. The project will be executed on the ‘design, build, finance, operate and transfer’ basis. The decision on the agreement was taken on Wednesday during a meeting between Union road transport and highways minister Nitin Gadkari and Haryana chief minister Manohar Lal Khattar in New Delhi. A memorandum of understanding will be signed between NHAI and MCG to implement the project in Gurgaon. The pilot project in Gurgaon is aimed to carry 30,000 passengers in a day and is likely to transform the transport in the city. The taxi system is proposed to have 14 stations - Udyog Vihar, Cyber City, Shyam City, Atlas Chowk, Sector 25, Iffco Chowk, Signature Tower Chowk , Sector 31, Jharsa Road, Rajiv Chowk, Tau Devi Lal Stadium, Sector 38, Subash Chowk, and Sector 47. Apart from the pod taxi project, the two leaders also decided that encroachments on the Dwarka Expressway will be removed soon for completion of the road project. The expressway has been assigned the national highway status. It was also decided that the construction of a link bypass to connect NH- 8 with MG Road of Gurgaon and bridges at Hero Honda Chowk and other places will be taken up on priority. Gadkari assured his ministry’s full support in speedy implementation of all projects in Haryana. He also said the progress of all schemes will be reviewed every three months.